Mike Romey minds the lines as Rescue 1 tows a sailboat through choppy seas on an April 19 mission. The organization receives no governmental monetary support and depends solely on donations to fund its operations for the year. 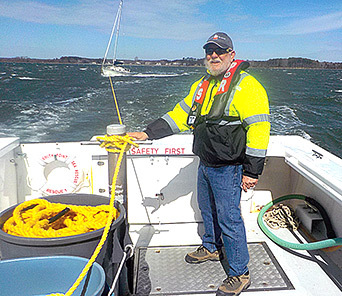 April 14: At 3 p.m., the captain of a 23-foot Four Winns Horizon bowrider called 911 to report he had just left Coan River Marina where his boat had been serviced and that his engine had failed. As he attempted to restart his engine, heavy wind pushed him ashore against Walnut Point. The duty officer for Smith Point Sea Rescue called the captain and determined that he was safe, but stranded ashore across the river from the marina. To reach the boater with Rescue 3 would have required running down the Potomac River, where the wind was currently gusting to 40 mph. The boater was asked to call the marina to ask for assistance, since the marina was only several hundred yards away. The marina launched a boat but quickly wrapped the tow line in the propeller and was also disabled. Seeing no other options, the crew of Rescue 3 responded and towed both boats back to the marina for repairs. Time on call, 2 hours. April 19: At 3:20 p.m., the Sheriff received a call from the captain of a 30-foot sailboat from North Carolina. The captain reported his engine had failed and he was now anchored in heavy wind at the mouth of Cockrell Creek, attempting to reach Reedville. Rescue 1 was dispatched and towed the boat to the Crazy Crab restaurant. Time on call, 1 hour. April 25: At 10 a.m., a commercial crabber reported his outboard engine had failed as he was pulling crab pots in the Chesapeake Bay between Dividing Creek and Bluff Point. Rescue 1 located the 22-foot skiff and towed it up Dividing Creek into Lawrence Cove where the crabber lives. Time on call, 4 hours. May 1: At 1:30 p.m., the U.S. Coast Guard received a call from a female on board a 43-foot Grand Banks trawler who reported that as they were approaching Reedville her husband had collapsed and apparently died onboard. Rescue 1 was dispatched with Northumberland County’s chief of emergency services Rick McClure onboard to intercept the vessel and provide any assistance necessary. The crew was shocked to recognize the vessel as being owned by a Reedville couple who were returning from their annual winter stay in Marathon, Fla. The female reported that she was very capable of operating the vessel and that she just wanted to reach home. With heavy hearts the crew of Rescue 1 escorted the vessel to her pier where the proper authorities awaited. Time on call, 2.5 hours. This sad event is a reminder that if you are the captain of a vessel it is your responsibility to ensure that another member of your party can operate your vessel and knows how to call for help if you are disabled.